(0 Customer Reviews) | Write Review 9 issues per year Hype Hair Magazine is the go to publication for all things hair and beauty for the sophisticated Black woman of today. As one of the most popular magazines in Black hair salons around the country, Hype Hair is one of the most read sources around for the hottest in hair trends for Black Women. The publication features all of the best of celebrity hairstyles and superstars such as Beyonce, Rihanna, Nicki Minaj and Halle Berry have all graced the covers of this premier hair magazine. Whether you are looking for a chic, short cut, a glamorous hair look or just want a few make-up tips to update your look, Hype Hair has it all and so much more! 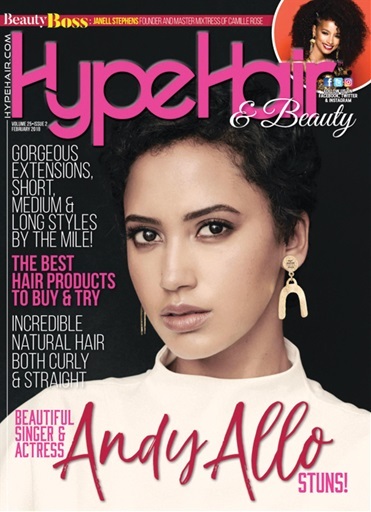 Cameroon-born singer and actress Andy Allo shines on the cover of Hype Hair’s February 2018 issue. More than just a pretty face, Andy has secured her place in music history as Prince’s former protégée and singer/guitarist in his New Power Generation band. She even worked directly under the legend himself for her sophomore album Superconductor. Since then, she has been tapped as the next big thing in music. Hype Hair Magazine is the go to publication for all things hair and beauty for the sophisticated Black woman of today. As one of the most popular magazines in Black hair salons around the country, Hype Hair is one of the most read sources around for the hottest in hair trends for Black Women. The publication features all of the best of celebrity hairstyles and superstars such as Beyonce, Rihanna, Nicki Minaj and Halle Berry have all graced the covers of this premier hair magazine. Whether you are looking for a chic, short cut, a glamorous hair look or just want a few make-up tips to update your look, Hype Hair has it all and so much more! You'll receive 9 issues during a 1 year Hype Hair magazine subscription. You'll receive 9 issues during a 1 year Hype Hair magazine print subscription.